August 27th is the feast day of Saint Monica. She is remembered for her suffering caused by her prayerful life dedicated to the reformation of her son, Augustine. Augustine led an immoral life until in his thirties when he embraced the Catholic religion becoming a philosopher whose writings were very influential in the development of Western philosophy. His writings from the late 300s continue to be widely read today and profoundly influenced the medieval worldview. In respect to his wayward youth he is the patron saint of brewers. His mother is patron of motherhood and disappointing children. Saint Monica’s relationship to San Miguel stems from a 17th century building that sits on the perimeter of Parque Juarez rebuilt by a 1930’s Hollywood movie star for his mother. Jose Mojica was born in at the turn of the last century and became an accomplished tenor and film actor for Fox. 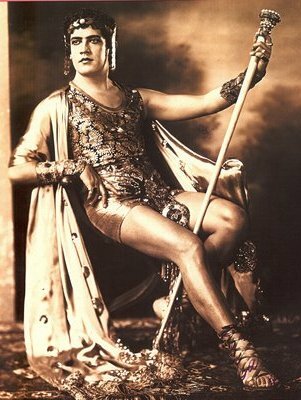 Together with Dolores del Río, Ramón Novarro and Lupe Vélez, he was among the few Mexicans who made history in the early years of Hollywood. Mojica restored the long abandoned 17th century estate around 1930 as a home for his mother. Here they entertained his friends from the artistic community such as María Félix, Dolores del Río, Gary Cooper, John Ford, John Huston and John Wayne. It was the death of his mother in 1942 which put an end to Hollywood, singing, and romance for Mojica for at his mother’s deathbed, Mojica promised her to become a priest. He then gave up his professional career, became a cloistered monk and distributed his estate to form the orphanage for boys, Mexiquito, still in operation today by a dedicated group of Dominican nuns. The orphanage hosts the sanctuary for Our Lady of Guadalupe here in San Miguel de Allende. The Antigua Villa Santa Monica has been a prestigious hotel and restaurant featuring roaming peacocks since the 1940s. In fact there are still some trees in the property that show plates with the names of those celebrities who planted them. 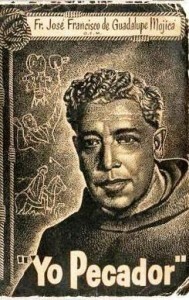 Mojica, after becoming a priest named José de Guadalupe Mójica, wrote Yo Pecador (I Sinner), which sold millions of copies and became a film in the 1950’s.